To help you get the best bang for your buck, we tested the two best value detangling brushes – Wet Brush vs. Tangle Teezer. 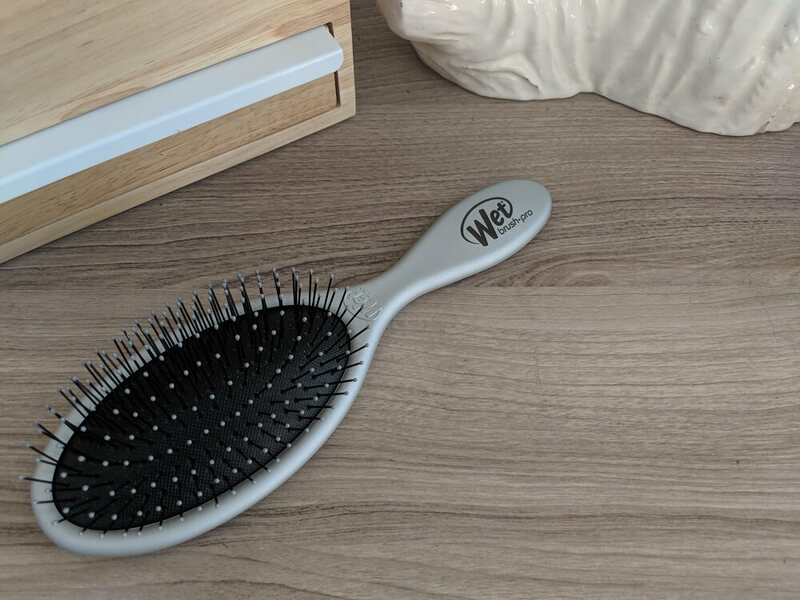 Find out why we think the Wet Brush Pro Detangler is the best detangling hair brush on the market. You hit snooze too many times and now you’re running late for work. You skip brushing your hair and just throw it up in a messy bun – no big deal, right? By the end of the day, you’re exhausted, so you jump right in the shower and then head straight to bed thinking you will just brush your hair in the morning. If this sounds like you, you are not alone. Many of us have made the same questionable decision and ended up paying for it later when we were faced with such a massive amount of tangled, matted hair that we actually debated the merits of just chopping it all off and rocking a pixie cut. Which Is Better For Detangling Wet Hair? Which Is Better For Detangling Dry Hair? 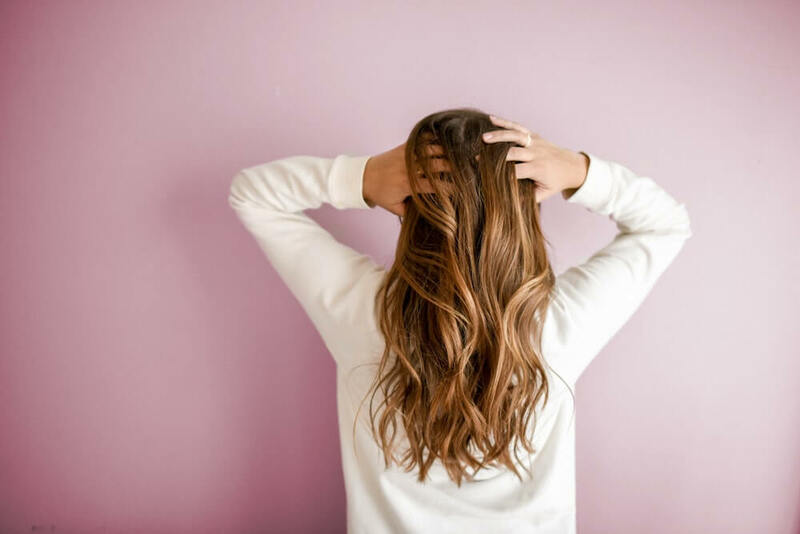 If you’ve ever found yourself faced with the unpleasant prospect of brushing out a tangled up head of hair, you may have wondered what actually causes our hair to tangle and what we can do to avoid it. Hair tangles occur when the outer cuticle layer of our hair becomes damaged and roughed up rather than lying flat. Damaged cuticles catch on other damaged cuticles and before we know it, we find ourselves with a matted up mess often referred to as a rat’s nest – not attractive! Even with the best of intentions and care, at some point, you will find yourself needing to brush out tangles and you will want to know which brush is the best suited to the task. To answer that question, we narrowed down the options and tested the top two products for you. When deciding which two products deserved to be in the running for the best detangling hairbrush, we first decided to narrow our search to the value market. Yes, there are high end products out there with great reviews, but do you really want to fork out $230 for a hairbrush? Didn’t think so, and neither do we! The two brushes we chose have emerged as top value picks among consumers. Both have great reviews, both are very popular, and there seems to be a lot of debate as to which is better. As companies, Wet Brush and Tangle Teezer both got their start selling detangling hair brushes. Since then they have branched out and they now carry a full line of brushes for all hair types and purposes. 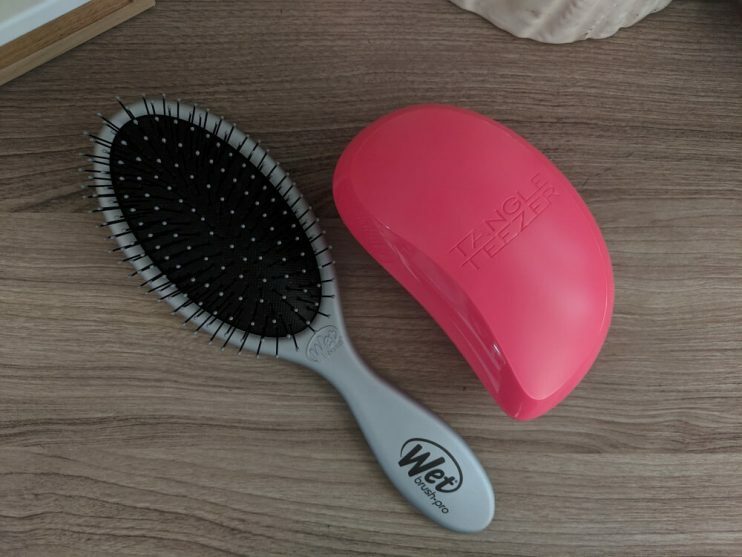 As our focus was specifically on detangling, we decided to test the “Wet Brush Pro” from Wet Brush vs the “Salon Elite” from Tangle Teezer. Tangle Teezer’s differentiating feature lies in the “two-tiered teeth system technology” which its inventor says “banishes tangles [and] knots and helps prevent breakage and damage.” The award winning design features longer teeth for detangling paired with shorter teeth for smoothing the hair cuticle. This is said to result in glossy, healthy looking hair. Both brushes are designed for use on either wet or dry hair. Brush your wet hair anywhere easily with the Pro Select The Original Detangler Brush Stone Cold Steel from Wet Brush. The Wet Brush set out on a mission to conquer the horrible issue of detangling hair without the tears or damage. Eliminates tangles and knots on contact and minimizes breakage. Memory flex technology, gentle and ideal on wet and dry hair. Our first impression of the Wet Brush was that it looked like…well, just a normal unassuming hairbrush. The Wet Brush has a full length plastic handle and its proprietary “Intelliflex” ball tipped bristles are mounted to a rubber cushion secured to a plastic body. The Tangle Teezer on the other hand, is small and compact. Rather than being mounted to a handle, the curved body of the brush is shaped to fit in the palm of your hand. The “two-tiered teeth system technology” consisting of an overlapping series of taller and shorter plastic bristles is mounted directly to the underside of the brush body. The Tangle Teezer’s diminutive size seems to make it a good option for traveling or to throw in your purse or car for on-the-go usage. When we compared average pricing, we found that the Wet Brush sold for an average of $8-$9. The Tangle Teezer’s average retail was $11-$13. 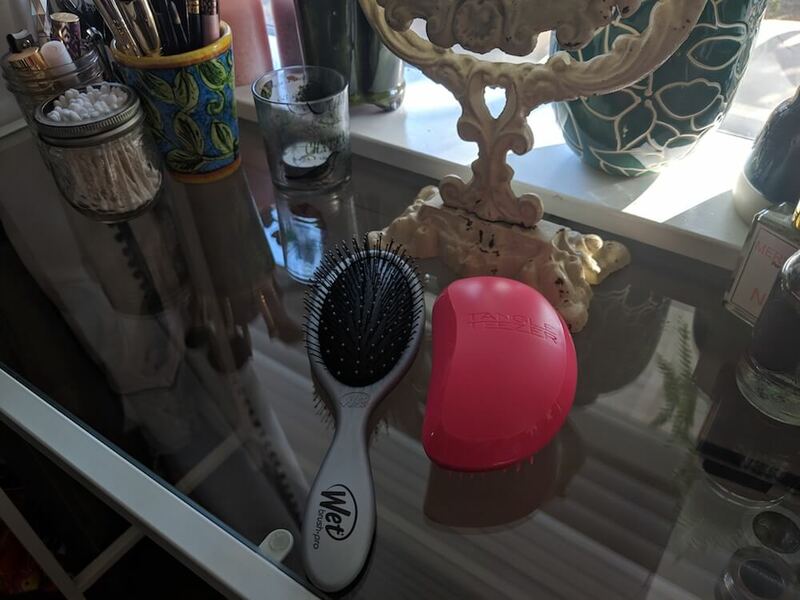 Both price points are solidly within the value hairbrush category, however the Wet Brush got the win here for an average $3-4 cost savings over the Tangle Teezer. Given their very different body styles, we decided it was important to test the ergonomics of the handle/grip when actually using each of the brushes. The traditional handle of the Wet Brush felt intuitive and easy to use. The contoured Tangle Teezer body grip fit nicely in our hand and seemed reasonably easy to use as well. Neither brush was uncomfortable to hold, still we found ourselves preferring the standard size and shape of the Wet Brush handle. This comparison was close, however the slight edge went to Wet Brush. Now that we knew what we liked as far as aesthetics and ergonomics went, we got down to the make-or-break defining tests for a detangling hairbrush – does it actually detangle hair? Specifically, we wanted to compare the brushes on their ability to successfully detangle both wet and dry hair. Speaking from decades of experience suffering through the hair detangling process, the results do not always justify the means. Just because a brush is capable of detangling our hair, it does not necessarily mean that the experience is an enjoyable one. We knew we needed an honest assessment of the level of pain associated with the detangling process for each hairbrush. Finally, no fighting with products in an effort to get them to work properly. We tested the ease of use for each of the brushes. First up was the wet hair detangling test using the Wet Brush. As we brushed, we could feel that the brush’s bristles were thick and sturdy. This made brushing through the tangles easier and faster. When we replicated the test using the Tangle Teezer, the process was a lot harder. It felt like it was more difficult to brush our hair thoroughly and brush through every strand. We found that we really had to push/press down to work the brush through all of our hair. Based on this experience, we suspect the Tangle Teezer may not be a great option for those of us with thick hair, curly hair, or a large amount of hair. The winner of the wet hair detangling challenge was clear. Wet Brush provided easier, quicker, and more thorough detangling than Tangle Teezer. Since it is a full size brush, it is also better suited to those of us with more hair or thicker hair. We conducted the detangling test again, this time with dry hair. As with the wet hair test, the Wet Brush quickly and easily removed our tangles. This time, the Tangle Teezer also did the job, but it felt like it took longer to brush & detangle our hair than it did using the Wet Brush. Quick, easy, and thorough wins when it comes to functionality testing. 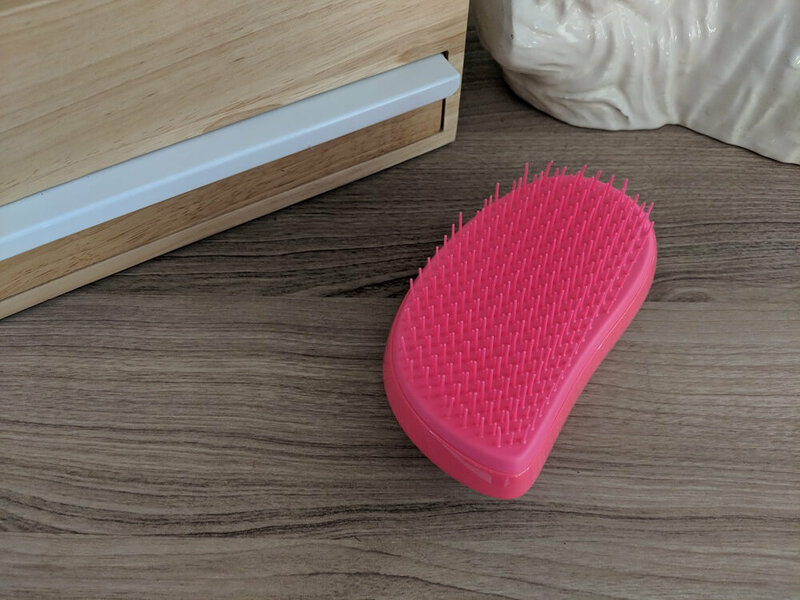 As we were putting the hair brushes through both our wet and dry detangling tests, we also made sure to pay attention to the levels and causes of pain that we experienced with each brush. In both tests, we noticed that perceived pain was a result of two factors: the brush tugging on the hair and the bristles digging into the scalp. The Wet Brush felt like it glided through our hair more gently. The cushioned body absorbed some of the shock and the bristles flexed just the right amount when they encountered a tangle. Our tangles were removed without us feeling too much pulling sensation. We also found ourselves appreciating the padded ball tips on the bristles as this let them glide smoothly over our scalp rather than digging in. Having to press harder and brush longer with the Tangle Teezer no doubt increased our pain levels. The brush seemed to pull more at our hair and the bristles felt sharper on our scalp than the Wet Brush. The competition on this test wasn’t even close – Wet Brush came away as the hands down winner for inflicting the least amount of pain. Both the Wet Brush and the Tangle Teezer were relatively easy to use. That said, Wet Brush got the win here because of its standard handle and because we didn’t have to press as hard or brush as long to achieve full detangling. To quantifiably determine which product deserved the title of “Best Detangling Hairbrush,” we rated both Wet Brush and Tangle Teezer on 6 key performance factors. 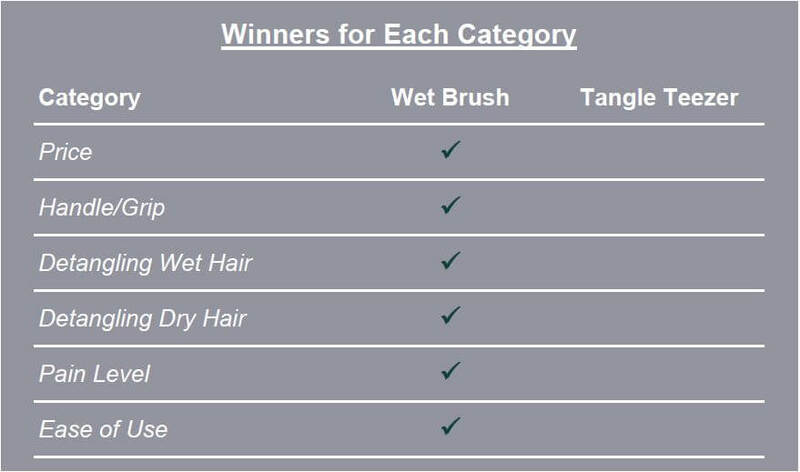 Wet Brush was the unanimous winner, coming out on top in all 6 categories. Wet Brush has excellent value pricing and a comfortable handle. It excels at providing fast, smooth detangling of both wet and dry hair with minimal amounts of pain and superb ease of use on all hair types. We would recommend Tangle Teezer for on-the-go use due to its compact size, but Wet Brush is definitely the star of the hair detangling show. Before you click the order button for your Wet Brush, take a moment to check out the astounding 43 unique colors and prints the Wet Brush brush currently comes in. They have everything from glitter and galaxy to sugar skulls and hipster – so much more fun than just a basic black brush! Want some great add-ons to go with your order? We have our eye on the “pop and go” detangler brushes as well as the 2017 allure award winning shower detangler brushes for ourselves. The “plush brushes” are designed with kid-friendly handle sizes. Instead of prints on the back of the brush, they actually have a little plush stuffed animal cover. You can get a puppy, panda, kitty, or even a unicorn with a rainbow mane! Dry cuticles are more prone to damage than cuticles that are properly hydrated. Use conditioner regularly and allow it to sit on your hair for the recommended amount of time. Try supplementing with a weekly hair mask treatment for extra hydration. Heat from blow dryers, curling irons, and flat irons can pull all the moisture back out of your hair and leave the cuticle vulnerable to damage. If you must use these tools, do what you can to limit the amount of time your hair is being exposed to the heat. Towel dry hair prior to using your blow dryer. Look for brands with ceramic, tourmaline, or ionic components which cut down on overall use time.There are also heat protectant sprays that can be used before curling or straightening your hair that help to minimize heat damage. Looking to go from jet black to platinum blonde? The chemical process involved has the potential to really do a number on your hair’s health. Talk to your hairstylist first; an expert can help you plan a multi-step transition which will be gentler on your hair than a rapid approach. Wet hair is much more delicate than dry because water temporarily breaks down the hydrogen bonds in the hair shaft leaving it weaker and more vulnerable to damage. When towel drying hair, do it gently by squeezing not rubbing. Use caution when brushing wet hair. Be gentle and only use brushes designed for the task. To minimize brushing of wet tangles, brush tangles out prior to showering, when hair is still dry. Hair, especially long hair, is prone to tangling as we move around in our sleep. Help to mitigate this by sleeping on silk or satin pillowcases. You may also try wrapping your hair in a hair wrap or, if it is long enough, braiding it. Hair ties and bobby pins can cause damage to our hair and stress to our scalp when they are placed in the same position on a regular basis. Try alternating between a high pony, low pony, and braids. If you always pin your hair in a top knot, try a chignon instead. Variation is key. We have done all the research and hands on testing for the best detangling hair brush, Wet Brush vs Tangle Teezer. When you need an effective detangling brush at a reasonable price, a brush that is easy to use and virtually pain free, a brush that comes in a fun assortment of styles, we recommend Wet Brush.